Concrete. It’s in our blood. Well, not literally, obviously – that would just be uncomfortable. We adore concrete and we’ve worked with it in all its various forms for years. Whatever your concrete needs, we can fill them – literally and metaphorically! Concrete is unique. There is simply no other stone surface like it. You could pour and re-pour concrete a hundred times in the same area and you would have a hundred different floors. The unique properties of your sub-floor, the concrete mix, the movement of the earth beneath it, all combine to turn your concrete into a unique and beautiful work of art. We treat every concrete floor we handle with that in mind, carefully restoring and finishing it to the most beautiful it can possibly be. Even though concrete is a tough cookie, it has a sensitive side and needs skilled care to keep it looking its best. Stone Surface Specialists are the experts in concrete. We have worked with concrete in every incarnation you can imagine (and probably a few more, but who’s counting! ), so whatever your concrete’s issue, we will care for it with love and skill. Some of our concrete services: Polishing, Decorative Finishes, Coatings, Waterproofing and Repairs. Applications: staining concrete, stamped concrete, colored concrete, concrete dyes, concrete polishing, concrete resurfacing and concrete overlays. Outdoor Concrete: patios, driveways, pool areas, walls, pavers, walkways, outdoor kitchens, counters and fireplaces. 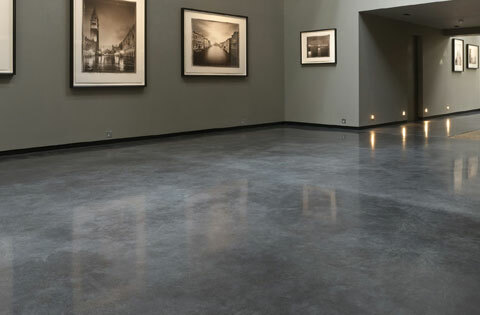 Indoor Concrete: floors, garage floor coatings, basement floors, countertops and fireplaces.